The motor is surprisingly standard CT110 postie bike, series compound turbo charged with a custom forged piston, billet aluminium barrel and some headwork. Why a Series Compound Turbo? Series compound turbocharging is where two turbos are used in series with one feeding into the other. One turbo draws in ambient air and compresses it before pushing it into a second turbo which compresses the air some more before feeding it into the engine. Series compound turbocharging is very different to twin turbos which are typically used on a vee engine with two cylinder heads and have one turbo working off of each bank. 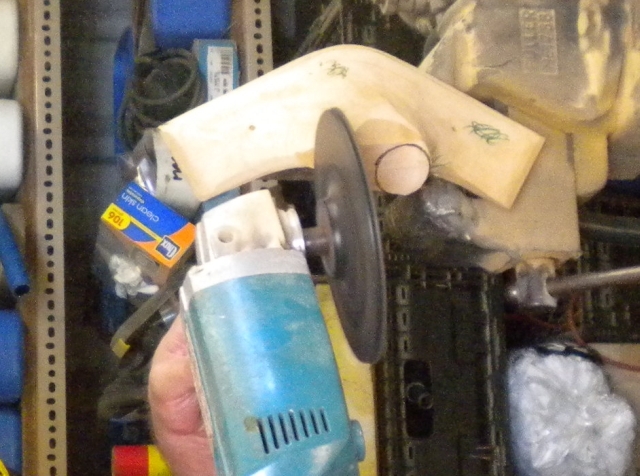 Small motors need small turbos – no surprises there. Small turbos are however relatively inefficient mostly due to their high surface area to volume ratio. 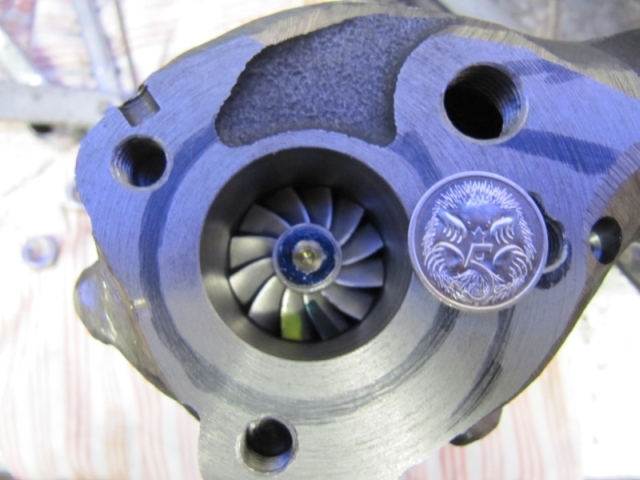 Small turbos also tend to have a lower available pressure ratio, where as more normal size turbos have no trouble at all operating with great efficiency at 4:1 pressure ratio and higher but obviously are an impossible match for a small 125 cc motor. A small turbo is way off the compressor efficiency map at just 25 PSI boost, but two correctly sized turbos in series compound each sharing the work of creating 45 PSI boost pressure can be both at peak efficiency on a small 125 cc engine. So we run series compound turbos for the same reason as the diesel guys: a higher overall pressure ratio than achievable with a single stage. The most simple way to explain compound turbos is that their pressure ratios ‘multiply’, consider a turbo operating at 15 PSI boost (30 PSI absolute), that is a pressure ratio of about 2:1 in round numbers (or twice atmospheric pressure). Now feed that turbo into another turbo also operating at 2:1 pressure ratio and the resulting boost pressure is 45 PSI (60 PSI absolute). A pressure ratio of 2:1 multiplied by a pressure ratio of 2:1 results in a pressure ration of 4:1 (or 4 times atmospheric). The big trade off with a series compound turbo is complexity: two turbos, two oil feed lines, two oil return lines and twice as much exhaust inlet plumbing. Although mandatory if you wish to run more boost pressure than a single turbo stage can deliver, the advantages are a larger efficiency range , a wider power band, an ultimately higher boost pressure and all with a greater safety margin from the surge line. Intercooling makes more power because the cooler charge air is more dense. The reduced intake temperature translates pretty much directly into the same reduction in exhaust gas temperature. Intercooling also allows the same amount of horsepower to be made using a lower boost pressure. Lower boost pressure means a lower exhaust back pressure. The lower the temperature and pressure the further away from engine destroying detonation. 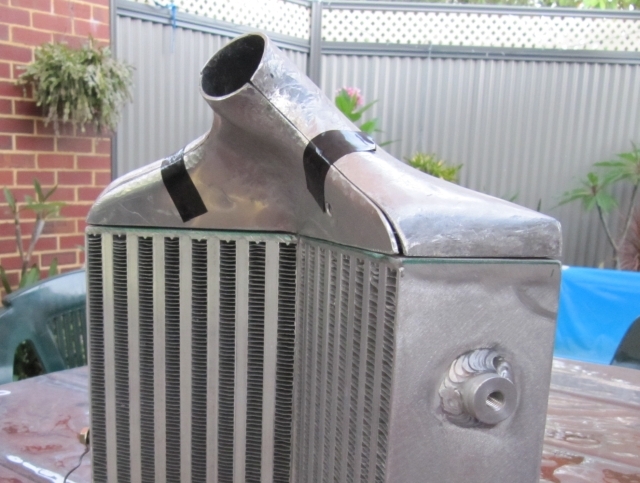 Why both an ice water and air intercoolers? The air to air intercooler sheds a lot of heat energy, after that the ice intercooler has an relatively easy job (read: amount of ice melt or ‘kilo joules’ required) to further reduce the charge air temperature. If there was only the ice intercooler then it would need to be much larger and a lot more ice would be required to achieve the same resultant change air temperature. If the ice intercooler was first, feeding into the air to air intercooler, the air to air intercooler would then heat the air back up again! 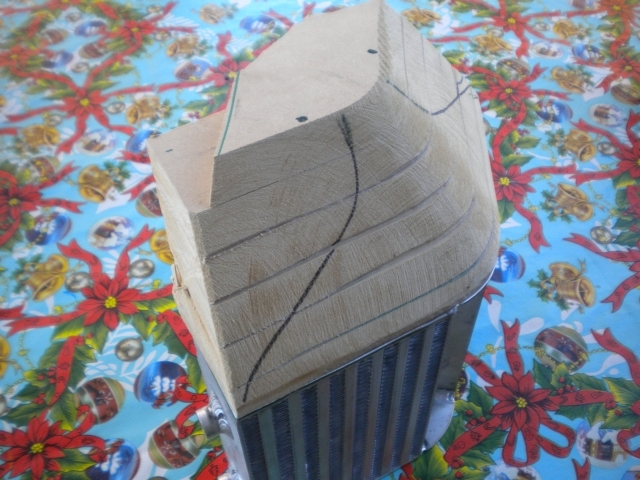 The air to air intercooler end tanks were manually hammered out over free formed soft timber, very old school but very free flowing and with uniform air distribution.